Most people will say that it looks like Jesus. I would have said the same years ago before I started studying the Bible. It has been proven that if you repeat a thing over and over, people will come to believe it whether or not it is true. The movies, TV, and paintings have all depicted Jesus as having long hair…but is it true? Since most of the paintings of Jesus we see were painted around the middle ages when men wore their hair long, I believed that is where the artists got their inspiration. Some have said (erroneously), that Jesus was a Nazarite like John the Baptist Luke 1:15-17, or Samson Jdg. 13:7, they were not to cut their hair or drink anything from the vine. Jesus however was a Nazarene (Meaning from Nazareth). The word Nazarite comes from the word nazeer meaning separated of consecrated. Ok, so where did the idea of Jesus having long hair come from? 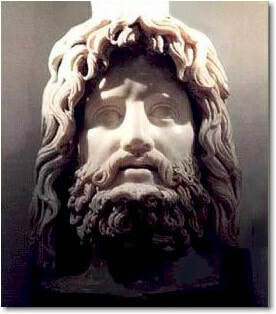 ​The picture above is a bust in the Cairo Museum of the Egyptian god Serapis. This god had been famous for 600 years in Egypt and now his worship was found all over the Roman Empire. He was equated with the Greek god Zeus (the chief god over all other gods) along with Asclepius (the god of healing). Professor Everett Ferguson in his excellent work titled Backgrounds of Early Christianity shows an example that the statues of Asclepius (the pagan god of healing) were images "that imitated Zeus and that his portraiture influenced artists in depicting both Sarapis [the Egyptian Zeus] and Christ" (p.114). Whether this is true or not, I have found that different religious sects believe things that are not true to the Bible. Some believe that every time you sin you are going to hell, others believe that they can pray to Mary instead of to God in the name of Jesus, etc. Many beliefs such as Christmas, Easter, and others came from pagan religions. We, as Christians, should rely on the Word of God ONLY. If we do, and disagree, then we must take it to the Lord, and the Lord, who is faithful, will give us the answer. Our God is not a God of double standards.